The year was 1948. Prescott – a town of about 6,000 – was getting on its post-war feet: building roads, opening schools and modernizing medical care. “Mel” is Melvin W. Phillips, MD, a veteran who served as a battalion surgeon during the war and then completed a medical residency in Tacoma, Washington. In Prescott, Dr. Phillips started a thriving medical practice and was soon busy caring for people throughout the community. He even traveled to Bagdad twice a week before that town had a local doctor. It wasn’t long before Mrs. Phillips – a mother of two – also was helping a community in need. She joined the Yavapai County Medical Auxiliary and was soon contacted by Prescott Community Hospital’s board chairman with a question: Could she help the hospital with the $400 year-end budget shortfall it faced? That first charity ball raised $4,000 for the hospital. It took place at the Prescott National Guard Armory on Gurley Street. Mrs. Phillips and her committee transformed the armory into an elegant holiday setting. Musicians played on the stage as women in gowns and men in their finest attire danced under starry lights from a crystal ball. Only Mrs. Phillips and her committee knew the stage curtain was drawn to hide the artillery stored there. The charity ball was one of 17 the Medical Auxiliary would host for the hospital. The event cemented Mrs. Phillips reputation as a resourceful, smart and energetic community leader and volunteer. Soon, she was involved in other significant community causes promoting the arts, education, healthcare and more. “I was once introduced as an ‘upstart’ after all of that,” she said. Determined and civic-minded could also describe Mrs. Phillips. Consider when the community decided to combine the resources and services of Prescott’s two hospitals into Yavapai Community Hospital, now Yavapai Regional Medical Center (YRMC). The new hospital was the result of a hospital district formed in 1960, a bond issue passed in 1962 and federal Hill-Burton funds. It featured 73 medical-surgical beds, 32 extended care beds and an obstetrical unit. What it didn’t include, Mrs. Phillips noticed, were drapes in the patient rooms. “That was something Hill-Burton didn’t fund,” she said. Not to be deterred, Mrs. Phillips approached local civic organizations to sponsor the window coverings. She recruited a local seamstress to sew the drapes and then sent the curtains to California for fireproofing. Soon, every patient window in the hospital was covered. Her positive attitude has brought myriad programs and improvements to the community. Mrs. Phillips was among four women who went door-to-door, raising money to construct Good Samaritan Society – Prescott Village, the community’s first modern nursing home facility. Many community pillars stand tall today thanks in part to Mrs. Phillips. She helped establish Prescott Center for the Arts (formerly Prescott Fine Arts Association), Yavapai County Traffic Survival School, West Yavapai Guidance Clinic and Yavapai College Foundation. 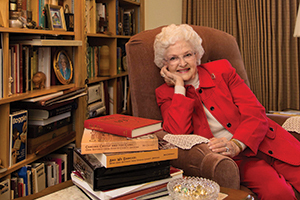 Her interest in Yavapai College Foundation continued through the creation of numerous scholarships, including many that help students pursuing nursing degrees. Mrs. Phillips has also served more than 60 years in the GFWC Monday Club, which supports the Prescott Public Library. Mrs. Phillips helped her husband edit his book, Mile Hi Docs, published in 1996 shortly before he passed away. The book chronicles the history of the Yavapai County Medical Society. It also describes his experiences as one of the community’s early physicians. Dr. and Mrs. Phillips generously donated proceeds from Mile Hi Docs to YRMC. And given Mrs. Phillips record of service, there is no doubt more history in the making. Look for more stories and submit your memories to help YRMC celebrate its 75th anniversary. Visit yrmchealthconnect.org/memory-catcher to learn more.